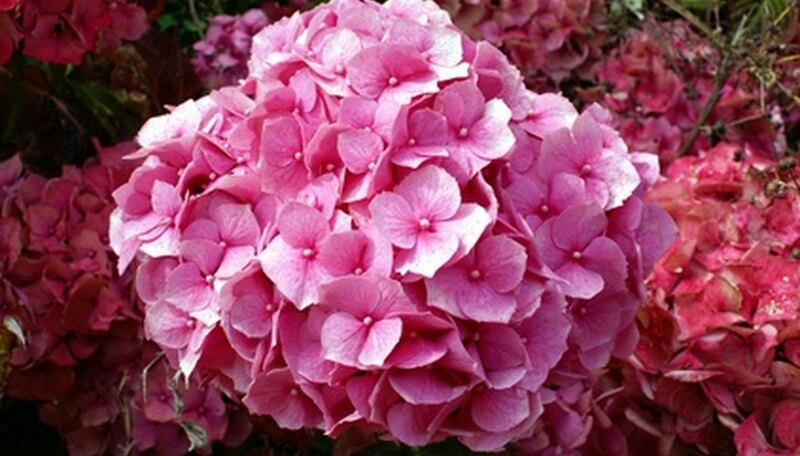 Big, puffy, pastel colored flowers make hydrangea one of the most popular landscape plants. In bloom from mid-summer to fall, hydrangea adds a soft accent to the garden. They are relatively easy to grow and, because they are native to woodland understories, do best when planted in the shade. Hydrangeas are not particularly disease prone. When an infection occurs, it can usually be traced to improper cultural and sanitation practices. Powdery mildew, a fungal disease, is a common disease for all but the oakleaf hydrangea (Hydrangea quercifolia). The most noticeable symptom of powdery mildew is a white powdery substance on the foliage. Powdery mildew, if not controlled, can cause stunting and discoloration of the flowers. Warm spring days with high humidity promote the disease. Avoid overhead watering, which increases the humidity around the hydrangea. Cutting back vegetation around the hydrangea will help to increase air flow as well, thus discouraging powdery mildew. Once infected, the use of fungicide sprays, on both sides of the leaves, is the best way to control powdery mildew. Leaf spot is another fungal disease that is encouraged when humidity levels are high. Overhead watering raises humidity levels and sets up conditions in which this fungus thrives. Several organisms cause leaf spot and the most common is Cercospora hydrangeae. Infections generally occur late in the growing season and can be identified initially by small purple splotches on the surface of the foliage. The spots will turn tan or gray and develop a halo. To manage black spot, prune off all infected branches in the spring. Further prune the hydrangea, or plants that are crowding it, to provide better air flow around and through it. Keep the soil clean of plant debris and change the mulch every spring. There are commercial fungicides available that will help control leaf spot. Small orange spots on the back of hydrangea foliage is a symptom of a fungal disease commonly known as rust. It occurs late in the season and overwinters in the soil. When the weather warms, in the spring, it will infect again. Nikko Blue hydrangea is particularly susceptible to rust. To control the disease, cut off all infected parts of the hydrangea and keep the soil clear of all plant debris. Increase air circulation by removing any plants that are crowding the hydrangea. Treat the plant with wettable sulfur sprays, according to package directions, once a week.